Last time we learnt about addition and we concluded that expressing exception would be the best point for discussion in this issue. Exception is the opposite of addition, indicating a ‘subtraction’ from a total. 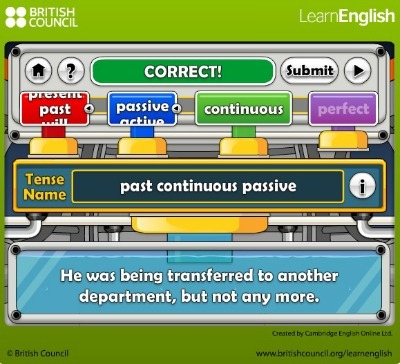 We express it by using a number of prepositions, such as: ‘except’, ‘except for’, ‘apart from’, ‘bar’, ‘but’. However, be very careful, as even is also closely related to the notion of addition: “He can speak several languages; he even claims to speak Chinese (‘that, as well as all the others’). What are the two most important things you can do to build increasing amounts of targeted traffic to your site? First, never stop creating high-quality content, which can bring you opportunities for top search engine (SE) rankings. Second, start attracting "votes of confidence" in your content by bringing it to the attention of your social media fans and followers. Many of these people will link to your pages from their sites or share your content socially. Once I’ve built the home page and the first two Tier 2 pages, I had to verify the ownership of my website with the search engines, and then I submitted my sitemap to Google and Bing. If you don’t do this, you may not get into a search engine's database, which means you are invisible to millions of people on the Web. Every time you publish a page (optimized with the help of Analyze It! ), your sitemap file rebuilds. SBI! then "pings" (notifies) Google and Bing once a day to let them know about any changes to your site (new pages, edited pages; for deleted pages, the engines are pinged immediately). There is such a thing as the SpiderWatcher, which checks your site's log files regularly, looking to see which of the major engines' spiders have visited your pages. After your page has been submitted, spidered, and listed, you need to check Search Engine HQ's Keyword Searches Report to find out the keywords and search queries for which your site and pages are ranking at the search engines. Good results tell you what's going right and give you something to build upon. Poor outcomes show you what needs to be fixed. What's next? You guessed it! Publish more reputation-building content, both on your website and beyond it. Build a strong social media presence to spread the word about you and your business, and generate those important "social signals" for the engines. Writing quality content for an influential blog or website, for example, not only gets you in front of that audience, it generates a rank-boosting link from the other site back to your site. Every 3-4 weeks, take a moment to update Search Engine HQ's Keyword Ranking Report so that you can track your site's performance at the search engines. As you start to see results, you will return to check for each spider's visit and to evaluate the performance of your pages less and less often. Why will you do it less often? Because you will be busy publishing more content, developing more trust and loyalty from your audience, and generally growing your reputation as an authority in your niche. It may take 2-3 months for traffic to start growing, but your efforts will pay off if you have followed the Action Guide and the articles in the Tips and Techniques HQ. You will start to rank well for a few pages at one engine, and then more and more pages at different engines. As you continue to build out your site's content and reputation, you will receive increasing volumes, month-on-month, of targeted traffic. Working with the search engines is essential. However, while it can be useful to occasionally check how your pages are faring, do not allocate more than a half- hour per week to monitor search engine performance. Invest your time on more important tasks to serve your visitors and your business best. Realize that you will never rank highly for all your pages at all the engines. So if you have a ranking in the Top 10 at one engine for any page, and you are happy with the Analyze It! report for that page, move on. 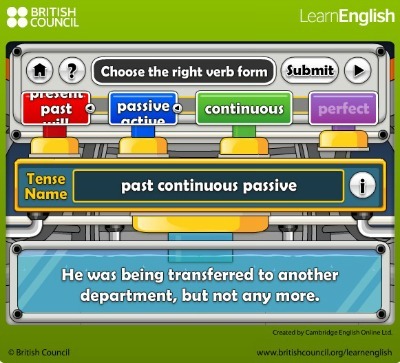 I’m proud to announce that I found a more advanced game for you to practise your verb tenses in complete sentences. You will be shown a sentence and just above it you have 4 multiple choice type of questions, for you to point out the correct combination of the tense, mood and form of the verb in it. 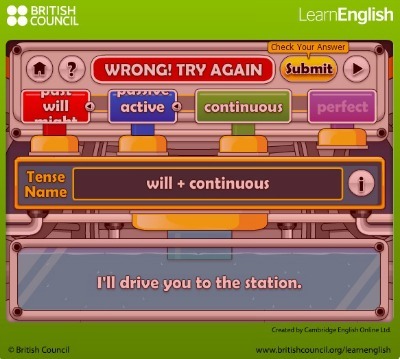 Once you’re sure you’ve selected the right options, you need to ‘submit’ your choice and the machine will tell you immediately if you’re right or not. OK, above we have the verb 'drive' in the form 'I'll drive'. Let's just say that we leave the options as they are: 'will + continuous', to see what happens. Should you want to change them, you need to click on the four buttons above the Tense Name and they lift, as you disengage them. So, we're being told that it's wrong, but we're not given the correct answer. Instead, we are prompted to try our hand at it again and that's what I call good practice. 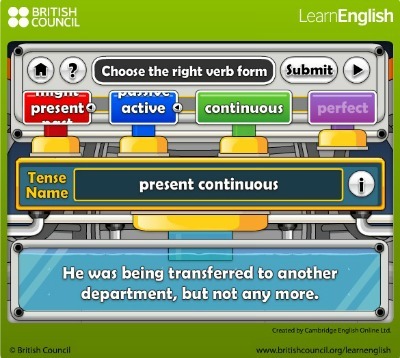 This one says 'present simple', but this is not present (given 'will'), and in no way 'simple'! 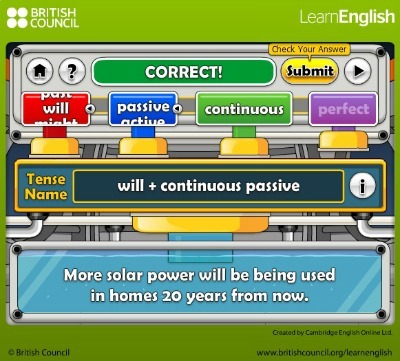 You guessed right: 'will' indicates the future tense; 'be used' indicates the passive; and 'being' indicates the continuous aspect. And so it goes, until you've covered 10 sentences correctly. 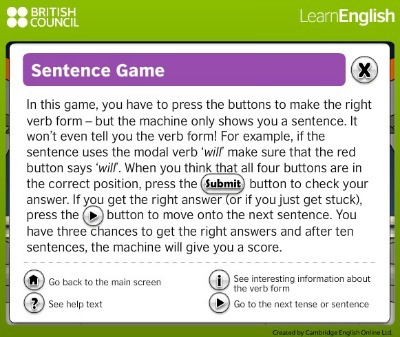 At the end you get the points you've accumulated and a chance to play another game. I'm so tired to end the game, that I think I'll add the end bit at a later stage.